Since reading Michael Pollan's The Omnivore's Dilemma a few years ago, I've been fascinated with learning about the food industry, where my food comes from, and how food is intended to fuel my body. I sometimes dream that one day I will run an organic farm and eat almost entirely plants and I will feel awesome all the time and it will all be thanks to the sunshine and the good Lord's provision. Last night I got a glimpse of what this life might be like and it. was. incredible. Dann and I decided a couple of months ago that we would take each other to an Outstanding In The Field dinner for our two year anniversary, and last night was our night. We arrived at Isabelle Farm in Lafayette, where we were greeted with cocktails and appetizers. We didn't bring our own plates for dinner, but you can if you want to. It's a fun little tradition. Dann told jokes and made friends while I wandered around taking photos. Leah (on the right, from Outstanding In The Field) and Natalie (on the left, FARMER) introduced themselves, gave us a quick overview of the evening, then sent us on our farm tour. I couldn't believe how beautiful everything looked. The sky was so blue, the mountains so majestic, and we were literally surrounded by food! Our little tour group included this lady from The Denver Post. Maybe she'll quote me in her piece. Ha. Our tour guide, Ben, was one of my favorite people of the night. He was so good at teaching us and answering our questions and being genuinely excited about growing food. When he told us about the process of harvesting watermelons each year, it made me want to volunteer to help. It was like watching joy on a person's face. I'm not sure how else to describe it. We could see the umbrellas out in the field, and we knew that something good was going on underneath them. I was like a little kid in a candy store. I think I said "I want to live on a farm!" to Dann 100 times over the course of the evening. It felt magical. After our tour of the farm (complete with popping tomatoes off the vine directly into my mouth - YUM), we made our way out to the table where our dinner would be served. By that time we had made friends with a few of the strangers and the idea of sharing a meal with this large group was not as uncomfortable as you might think it would be. We were also apparently a slightly smaller group than Outstanding In The Field normally hosts, but it didn't matter to us. We had great conversations with the people near us, and even made some friends we may see again. At one point, someone asked me about the first concert I ever went to. The resulting storytelling and hilarious memories were definitely highlights of the night. The woman sitting on the other side of Dann was celebrating her birthday and before we left she told him: "Whenever I meet someone who's a musician, I just know they're living their dream. So good for you." I was prouder than proud. The guest chef who prepared our meal was Steve Redzikowski from Oak at Fourteenth in Boulder. We haven't ever been to Oak at Fourteenth, but you better believe we're gonna go now. The food was fantastic and the wine that was paired with each course was a perfect complement. Now, I didn't keep my menu because I spilled too much food on it. Everything was served family style, and I dripped/dropped a few too many times. I don't think it had anything to do with the wine. This was the first course. Heirloom tomatoes, peaches, zucchini, cheese, nuts, mint. Delicious. I didn't think I liked shrimp and grits. And then I tried the second course. And all I wanted was to eat shrimp and grits forever. I forgot to capture the third course with a photo. I think it was because I was having so much fun. It was a pork tenderloin wrapped in bacon with green beans, potatoes, and mushrooms. And finally for dessert there was olive oil and honey cake with cherries and basil ice cream. Yeah, I said it. BASIL ICE CREAM. And it was so good. 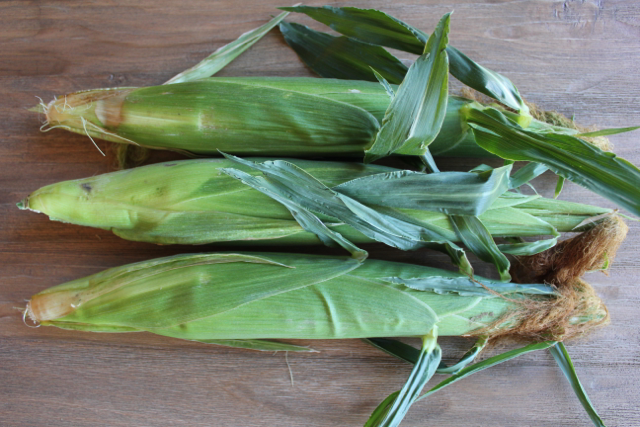 From the far end of the table came this just-picked ear of sweet corn. I didn't know you could eat it raw until last night. It was SO GOOD. 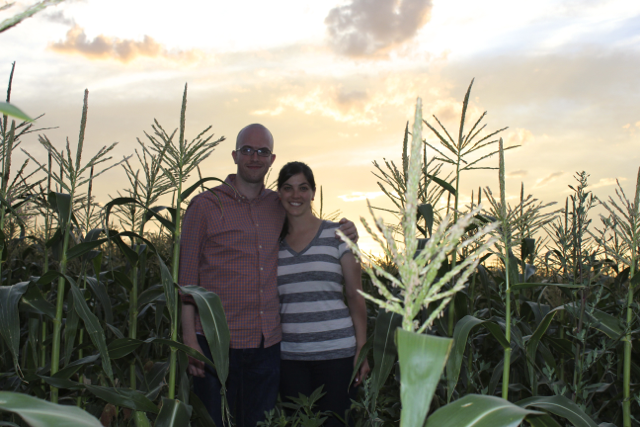 Natalie the farmer had this idea of taking a photo together in the middle of the corn as the sun was setting behind it. We asked her about the corn and she proceeded to take us on another short tour of the corn fields, teaching us how to know by the look and the feel whether the corn was ready to be picked. And then she sent us home with an armful of corn that she picked right there in front of us. It doesn't get any fresher, folks. I spent the entire ride home blabbering on about how much fun I had. I know Dann enjoyed himself too, but dang, I think everything about the evening either met or exceeded my expectations. The dinner was incredible, but even more than that I felt connected to the earth in a way I never have before. Literally picking food out of the ground and putting it directly into my mouth is not something I've ever experienced. It made me thankful for people like Natalie and her husband who do what they do. It made me thankful for the sunshine and rain the Lord provides that allows their plants to grow. And most of all it made me thankful for the people I love and the way a meal can bring people together like nothing else in life. Now more than ever, I want to live on a farm. Maybe someday.